I awake to find myself suspended above the forest floor, snug in my hammock, the earthy scents of pine needles sharp in my nose. It takes me a moment to gather my bearings, and I peer out from beneath the nylon rain fly to see the aquamarine expanse of Lake Superior laid out before me. My bleary eyes fall upon the only interruption in the horizon, and I smile as I recollect our destination today. The Hurons are a small archipelago of raw granite islands rising from the waters of Lake Superior about 40 miles northwest of Marquette, Michigan. The group of eight small islands are anchored four miles offshore from the mouth of the Huron River, surrounded by dangerous shoals and often draped in ghostly lake fog. My brother James and I had driven up the day before from our homes in Wisconsin, to take a narrow two-lane out of L’Anse, in Michigan’s Upper Peninsula. The road turned to dirt for a few miles more and finally ended here on the sandy shore in the Copper Country State Forest, where we had rough camped last night. After a quick breakfast, we carry the sea kayaks down the beach to the water. “It looks further than four miles …” James remarks as he buckles on his life jacket. Indeed, in the morning haze the Huron Islands seem far away, and appear to be suspended just above the seemingly endless lake. But we trust the charts on our foredecks and strike out onto glassy water, keeping the bows of our boats aligned on the rocky lumps and soon settling into a steady rhythm, pulling hard together in silence. In fact, from our launch point at the mouth of the Huron River to the easternmost of the islands, the crossing is closer to 4.6 miles, though our return crossing from the island group will be a bit shorter. Within the hour, we cruise into the shallows surrounding the rugged rocky islands. This area of Lake Superior is notorious for thick fogs and treacherous offshore shoals. Steamer traffic making its way along the coast between the ports of Marquette and Houghton-Hancock too often floundered and were shipwrecked along this stretch, especially as they made their turn around the nearby Abbaye Peninsula. Just off the eastern end of McIntyre Island lies a smattering of bare granite outcroppings barely rising above the water. Noted as Gull Island on modern charts, the larger of them is still known by some as Cattle Island. In May of 1860, blinded by fog, the side-wheeler Arctic ran aground here with a load of freight, passengers, and cattle. The captain was able to unload the boat’s cargo and passengers, including the beleaguered bovines, but a storm soon demolished the steamer where she lay on the rocks, and it was a complete loss. Local discontent over the lack of navigational aids—and the resulting frequent wrecks—had been simmering for years. But the ensuing public outrage over this incident raised pressure on politicians, eventually leading to a Congressional appropriation from Washington for construction of a lighthouse to guide the heavy lake traffic cruising these dangerous waters. But there is no death or destruction here today, and the Hurons are now a National Wildlife Refuge, established by President Theodore Roosevelt in 1905. Today, these rocky islands are an idyllic home for a sizable colony of migratory birds, including the once-scarce herring gull. Nesting bald eagles are drawn to the protected isolation, and the numerous shallows surrounding the islands make for good fishing from the wing. 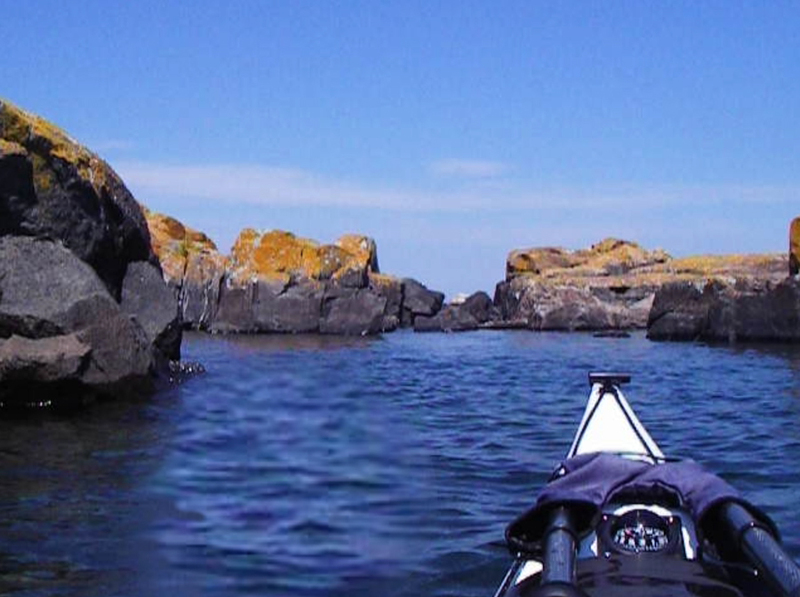 We cruise along close in to the island, exploring the convoluted, rocky shore. Most islands in the refuge are closed except for emergency landings by boats in distress, and only nearby Lighthouse Island is open to the public for hiking during daylight hours. Landing would be difficult anyway, the few coves we find here are laced with shoals and reefs, and bordered by large granite boulders and cobbles. The mile-long crossing to Lighthouse Island is uneventful, the namesake lighthouse standing tall and proud on her cliff overlooking the open lake. We cruise north-westward along the northern shore of the island below steep headlands, to the westernmost point, where a pair of fog signal buildings still stands. 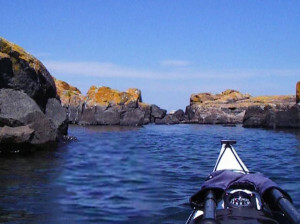 We round the point and turn east, paddling beneath sheer granite cliffs and finally gliding into the protection of a tiny cove on the southeast point of Lighthouse Island. 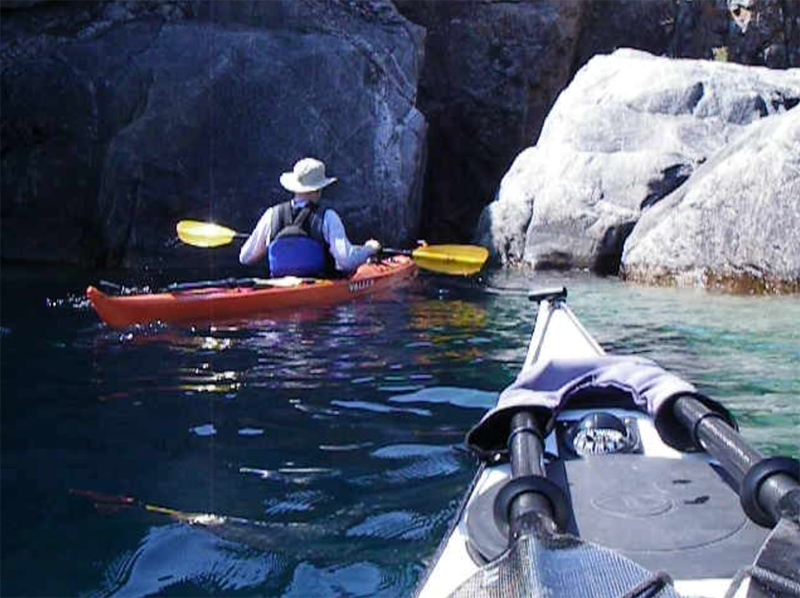 There is a dock here suitable for motor boats, but it’s a rough scramble to land our kayaks on the boulders lining the shore, a sharp contrast to the miles of sandy beaches on the nearby mainland shore. We pause for a quick lunch, this being our first chance to stretch our legs, since no landings are allowed, and there will be no more breaks until we return to the mainland. 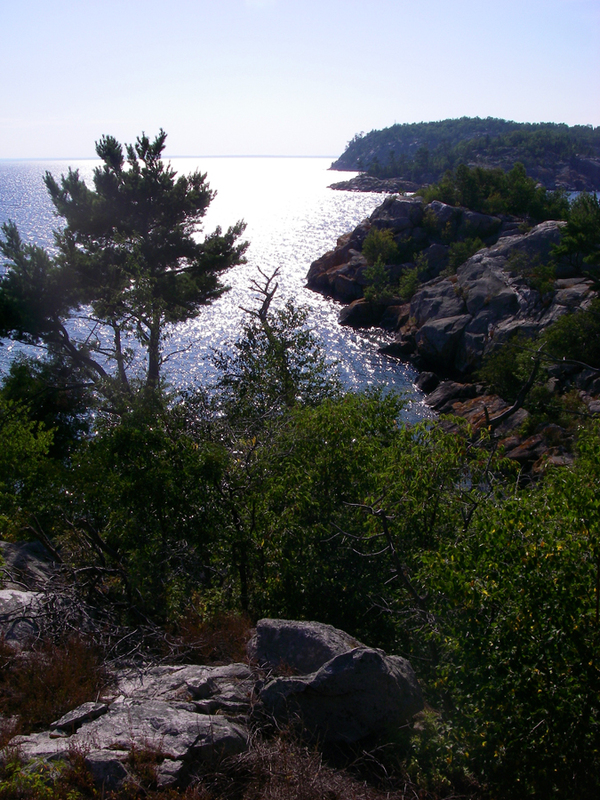 A quarter-mile trail hike leads up to the peak, and the aging concrete stairs open out onto the crest of the island, where the Huron Island Light stands watch over a breathtaking panoramic vista. 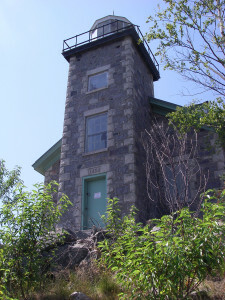 The wreck of the Arctic had spurred government to action, and in the spring of 1868 construction began on the light tower which stands here today, with a commanding view of the open waters. Built of native granite blasted from the island itself, the tower is only 34 feet tall but is perched atop the island’s peak, placing the third and-a-half-order Fresnel lens a full 197 feet above the lake level, and visible for miles around. A half-mile away, on the low northwest point of the island, are the buildings housing the former fog signal, once very important in these often-murky waters. The stone tower and main walls, the brickwork, and the wooden trim work are all in fairly good condition. All the glasswork in the light tower and most of the windows is still intact or has been replaced. In fact, considering their utter exposure to the brutal weather of Lake Superior, the buildings here have held up remarkably well for over a century and a half. From L’Anse, MI, drive Skanee Road 20 miles northeast, then follow Portice and Huron Rds. an additional 6 miles to the lakeshore near the mouth of the Huron River. Park off the dirt road and launch from the sand beach. 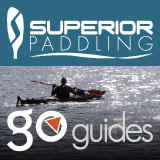 Have a comment or question about kayaking in this destination? Leave a comment below! Great trip. I like how you weave history about the islands into the paddling adventure. Keep them coming!